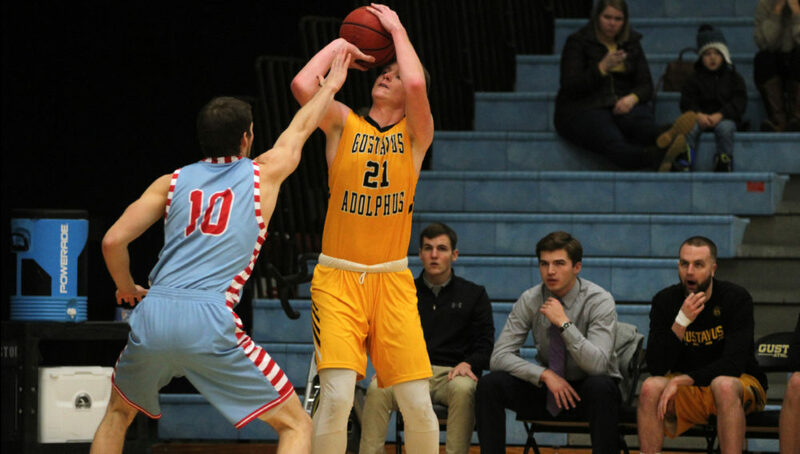 SAINT PETER, Minn. – The Gustavus men’s basketball team played host to Saint John’s on Saturday afternoon and fell by a score of 83-71. Riley Sharbono (Sr., Marshall, Minn.) scored his 1,000th point in the contest as the Gusties fall to 2-4 overall and 0-2 in MIAC play. The first half was a back and forth battle as there were nine lead changes in the first 16:38. The Johnnies took a 33-32 lead with 3:22 remaining in the half and they would hold a 40-35 edge at the break. In the second half the Gusties came out strong shrinking the Johnnies lead to 51-49 with 14:35 to play in the game but the Johnnies would go on a 14-0 run to extend their lead to 16 and they would eventually get it to 20 with 6:08 to play. The Gusties kept the fight alive and got the game to single digits when Logan Rezac (So., Andover, Minn.) connected on a pair of free throws but the Johnnies would make all their free throws down the stretch to ice the game. In the contest Sharbono led all Gustie scorers with 18 points as he shot 6-10 from the field. Isaac Douglas (So., Montevideo, Minn.) was a perfect 4-4 from the field for 10 points and CJ Woda (So., Maple Grove, Minn.) contributed eight points, three rebounds, and a pair of steals for the home team. The Gusties next contest will be at Macalester on Wednesday as they take on the Scots in a 7 p.m. contest.